Culver's brings back the Pretzel Haus Pub Burger for a limited time through November 18, 2018, while supplies last. 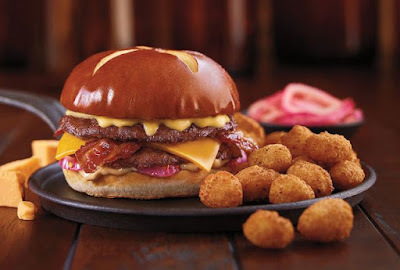 The burger features a pairing of pretzel and cheese (a slice of Wisconsin Cheddar as well as a warm Wisconsin Cheddar cheese sauce) along with two grilled beef patties (you can also get it with one or three patties), bacon, pickled red onion, and Bistro Sauce. Also back for the fall are the Pumpkin Spice Shake and Salted Caramel Pumpkin Concrete Mixer.